The US military is sending the most advanced aircraft in its arsenal, F-22 Raptors and F-35 Joint Strike Fighters, to South Korea to take part in a massive show of force next month that will feature at least 230 warplanes. The drill, Vigilance Ace, is to run from December 4-8 and will incorporate US military assets from the Navy, Air Force and Marine Corps, the US Air Force said November 24. 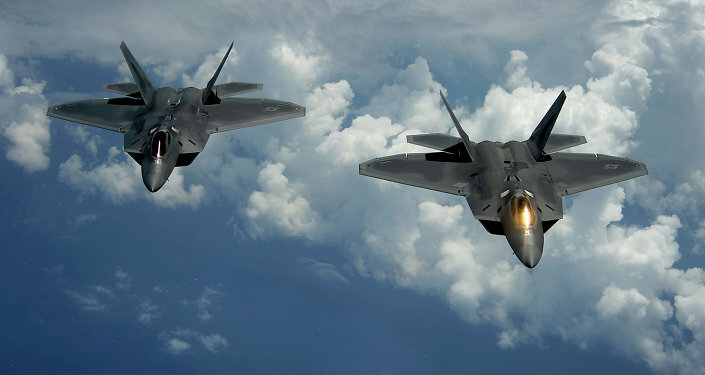 At least six F-22s and three or four F-35s will take part in aerial drills, Yonhap reports. The "realistic" combat exercise is tailored to "enhance interoperability between US and Republic of Korea forces and increase the combat effectiveness of both nations," the Seventh US Air Force, which operates out of South Korea, said in a Friday statement. Working from eight US and South Korean military installations across South Korea, more than 12,000 US personnel will be involved in Vigilance Ace. North Korean officials have frequently condemned US and South Korean war games as preparations for an invasion, but the US insists they are part of routine, business-as-usual operations and not influenced by current events. The US has moved to increase pressure on Pyongyang since US President Donald Trump traveled across Asia in the first two weeks of November. On Monday, Washington placed North Korea on a list of nations classified as state sponsors of terrorism. One day later, the US Treasury slapped new sanctions on the nuclear-armed state. Pyongyang blasted the sanctions as a "serious provocation" Wednesday while doubling-down on its vow to continue developing ballistic missiles and nuclear weapons. The tensions on the Korean Peninsula have escalated over the past year due to repeated ballistic missile launches and a nuclear test conducted by North Korea that were followed by United Nations Security Council sanctions imposed on Pyongyang. The US and South Korea, sometimes joined by fellow ally Japan, have also continued conducting land, sea and air military drills, which North Korea considers provocative, on and around the peninsula.